This is the original storyline to Space Station 13, as posted by Exadv1 to the SS13.net forums sometime between 2003-2005. We will not focus too much on how the earth looks but consider to be almost completly technological. They do contain megnetically levitated vehicles and in the United States the police force is very efficient but not dominating. It’s almost utopian besides a few problem sectors. It should be VERY clean. In SS13 it is important to note that the United Nations does exist and continues to help to direct a space initiative. However the primary player in such initiative is the United States. They have full control of the space initiatives dealt with in the SS13 universe. The United Nations works as a medium for other countries to use the United States facilities. 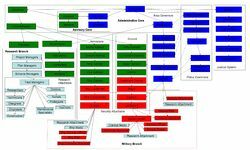 The command structure for the United States Space Program also known as USSP (UNSP is the United Nations version and contains the appropriate hierarchy to serve as a liaison with USSP). The largest portion of USSP and the portion said most often refers to the inter-system activities. It is called the Inter-Solar - Exploration and Research Initiative (IS-ERI). They spend an unstated portion of money and due to an alteration in the US government policies works almsot as a major corporation with the assistance of Nanotrasen a subsidary of the Expert Advisors Group (The msot widely known company with almsot firm control over the technology market). Almost every piece of technology and every station module was most lilely designed and built by Nanotrasen. Almost all of the researchers and technicians (fewer with forensic technicians) ONLY are Nanotrasen employees working with IS-ERI. The Syndicate which is the only known name for the largest criminal organization in the SS13 universe is extremely secretive and has moderate infiltration. Their infiltration into the US government is minimal as their public members on Earth are well-known. They however do not reside on Earth but instead on an unknown planet in some other star system. They are currently being tracked by the Inter-Agency Task Force (IATF) - The name’s meaning is minimal as it is an artifact from 2010 (think nationwide anti-terrorism squad that grew to control almsot everything... The other agencies roles are much more specialized. the FBI handles most US affairs still, the CIA handles the rest of the world, and the NSA grew to handle almost all information gathering). The Syndicate does not operate in the United States. It as stated earlier maintains a few ‘connections’ with the government and a few prominant organizations. Their ‘base’ on earth is hidden in Africa which due to a war remains very barren, desolate, and unindustrialized. The Syndicates main goals for operation is to take down IATF’s intricate defense matrix and to take over the United States. Their interest in SS13 will become evident later. Power: Ship power is generated primarily by nuclear fusion reactors. It’s moderately efficient. Most high-power reactors (like on the moon) use anti-matter reactors. They are almost perfect efficiency. SS13 was found by IS-ERI to be almost like a miracle for while their goals of inter-solar exploration and commerce was being fulfilled (they were making a mint on the materials they harvested.) they hadn’t ‘found’ anything interesting. There was no extraterrestrial life or hardly any new elements. Then one day Control and Command Station #13 in Sector 95-40A had found something around Tetran (a blue star). This something is hwta was called (by a sorta random name generator) Centration. Suddenly everyone was excited. there was a strange new material that was unlike other materials ever discovered. Now even though IS-ERI was the msot predominant space entity they still wanted to protect their little secret (especially after they found its deep military and research potential). They created SS13 as a simple materials handling station that basically havested and examined materials on SS13 (It’s real purpose is to coordinate the satellite analyzing matrix as well as to collect and research plasma). There were no metals of course on SS13 ... its almost pure plasma (except the core which hasn’t been able to be analyzed). Instead they were sending off a few bio-specimins (which themselves were VERY special because of how plasma ‘mutates’ certain atomic configurations). Then somehow the Syndicate found out about the possibility of IS-ERI discovering a new material. It’s VERY important to note that SS13 isn’t the ONLY place they looked. There are MANY more stations they are trying to infiltrate. Plasma is a revolutionary molecule. It was given its name for its distinctive orange color at room temperature (when in semi-liquid state). Researchers believe that it does NOT contain any neutrons. They belive instea it contains a different particle which they tentativly named Hieng A (which for all inensive purposes has no atomic charge). This particle which comes in many configurations (more on that later) but on Centration the most prominant form is the A form. This A form is specially attracted to Carbon atoms in that when a molecule of plasma comes in contact with it the energy contained in it vaporizes the carbon. Other configurations produce this effect excpet with different atoms and molecules. (note that some may not have this exact effect). The current theory is tht the electrical forces with carbon and hieng A particle are too distinct (physicists still aren’t certain what this means) that they are strangely attracted. Now onwards to what Hieng particles really do. They in essence stand for High Energy particle. They depending on the configuratio actually withing the electron cloud can store certain forms of energy. Mainly the configurations deal with radiant and thermal energy. What happens is the heat is attracted to the Hieng particle and then becomes trapped around the nucleus. This therefore increases the temperature considerably. It also makes the entire molecule more unstable. It is belive that at 0 Kelvin and -100 degrees celsius there is minimal energization and you have solid plasma that is VERY cold to the touch. At -100 to about -50 its believed to be in a liquid state (this is primarily what the cryo-healer uses). Now from -50 to 150 its in the common semi-liquid state where while its seeable it moves like a gas. Now here is where it stops being cold to the touch. At this semi-liquid state it is believed that the particles become somewhat saturated with heat and instead begin to function like sponges. Touching them with cold objects won’t cool things but instead makes them warmer by transferring away some of the heat. The next state is liquid because so much of the energy is in there that electrical attractions are being made. Now from 150-10000 its liquid. This liquid is vicious. It can ONLY be transferred by a very special container that is built to not be affected by heat. The material is very hard to make and therefore has only been used to line certain pipes and canisters. (The tanks level off their potential temp at 500. It contains a weaker version of the material). Now at about 50 degrees+ the plasma is unstable. Certain energetic pulses like electricity would cause a massive introduction of electrons into this mixture. These electrons are BAD. This causes the plasma to break down. Plasma can’t handle extra electron that well. This is why plasma ‘burns’. The extra electrons cause the Hieng to break down. The heat released causes massive temperature spikes. Now moving onwards to 10000+ we have something VERY unique. (Now since SS13 researchers havn’t been able to hat up plasma to this all of this is so far ‘theory’.) We have Plasma Solid. THis palsma solid has such a high amount of energy that it doesn’t cool down. If the plasma liquid is released and hits the ground it releases enough heat to create a fire which with the carbon involved started breaking down the Hieng creating a molten lava effect. A burst pipe of 5000 degree plasma onto the ground will cause an innocent lolking white orange spill that in a few seconds dematerializes the floor! Now at 10000 degrees the energy is so high that the magnetic signatures are altered and it no longer reacts with carbon. It aloso stops releasing heat! Instead it forms a thin outer layer that has the heat properties of steel. Meaning you could fashion little statues of these things. (At this stage the plasma when in contact with another block of plasma would absorb it. Trowing a block of plasma into a room of semi-liquid plamsa would just mop it up.) Unfortunately the electron problem isn’t resolved/ And at this temperature the heat released is BAD. About one nanogram of this solid plasma heated to 10000 degrees and then bathed with a few renegade electrons would evaporate a 1 meter sphere. Into thin air. The protons, neutron and electrons would evaporate. It’s pretty strange but in the effects a new materials might suddenly emerge. At about 1 microgram it may produce black hole type effects. In order to cool down plasma from solid to liquid to semi-liquid you have to bath it with neutrons to disrupt the Hieng particles and release the heat. From semi-liquid to the lower liquid just havng it in a no-heat atmosphere will bring the temeperature down. To go from lower-liquid to lower solid you have to bath it in neutrons while maintaining an almost 0k atmosphere. Going up is easier by using just continual heating. Researchers also produced Hieng - which does not cause any particle vaporization (as far as we know) and to them they have only made it in the solid state. It’s main neatness is that its super-conducting and works marvels in electronic conduits and certain larger computers. Hieng+ - Hypothetical only- attracts and consumes electrons, cannot pair with protons so not a true element, would have to be with neutrons. Nanotrasen Administration, Nanotrasen Security, Nanotrasen Research. Corporate Motto: Knowledge. Power. Safety. Corporate Headquarters: Nanostrasen Lunar Command Nexus (Main base for Nanotrasen Administration and Nanotrasen Security). Main Areas of Dominance: Nanotrasen Home Galaxy, Andromeda. Nanotrasen Earth Control Center - Part of main base for Administration/Security. Nanotrasen Mars Research Hub - Main base for Nanotrasen Research. Nanotrasen Sol System - Groups all the core assets together, protected by massive satellite array. Nanotrasen Alpha Centauri - Emergency backup, has large security detachment. The official hierarchy of Nanotrasen. Nanotrasen Arbiters Council (Arbiters) - council members, watch for problems, are "attached"
Nanotrasen Inquisitor Tribunal (Inquisitors) - Actually does investigating in problems, is "special council"
Also, there isn't much inter-department friction. Although on a low level basis, some Researchers are considered eccentric by some Security. The groupings are really just for location of offices on the main bases and how the uniform is arranged. IS-ERI, IATF, USSP, UNSP are all no longer part of SS13 history. Also, there isn’t much inter-department friction. Although on a low level basis, some Researchers are considered eccentric by some Security. This page was last modified on 8 April 2019, at 22:52.